One of the best things in life is staying at home relaxing and watching your favorite movies. If you want to upgrade your TV set though and turn it into your very own cineplex, you need a quality home theater system for that. With this setup, you can watch your favorite movies with excellent picture and sound quality in the comfort of your own home plus, on a schedule that you prefer. Hence if you want to try out the advantages of having a good home cinema setup, you have to make sure that you pick one that will definitely accommodate your needs. Here is a review of the Pioneer 5.1 Home Theater System. This Pioneer home theater setup is a complete audio system that connects to a range of audio resources like TVs. It comes with a 5.1 AV receiver, which makes use of high-tech 4K ultra-HD pass-through with ECO model for less energy consumption. The assembly is for homeowners who want to improve their movie-viewing experience at home. Another interesting attribute of this setup is that it can accommodate Apple connectivity. It includes a USB input in front that takes in music playback and manages by means of Apple products like iPads or iPhones and lets users play MP3s. the package also comes with 2 compact front satellite speakers plus a soundbar and subwoofer. This is one of the better home theater systems being sold on the market today and it surely helps that it is manufactured by one of the most trusted companies around, Pioneer. Pioneer has been in the business for decades and they know what people need when it comes to their entertainment desires. A great thing about this system is its ECO mode feature because it helps you save energy while the system is being utilized. It also corresponds well with Apple units and can accommodate 3D as well for games, Blu-ray discs, and broadcasts. Such features are what make this unit a worthy purchase. Another advantage of having this unit on hand is that it gives superior audio quality. The 4K ultra-HD compatibility of this system makes the setup an impressive AV assembly. As we all know, 4K ultra-HD is the latest in terms of HD picture display accommodated by this Pioneer system. This means that it can be hooked up to a television with 4K properties and it will not hamper your viewing. This setup comes with HDR support, which is designed to build plenty of realistic pictures and colors. One advantage of this feature is that users will be able to view similar images they would often see viewing those images in real life. Apart from having Apple connectivity, the system is also equipped with Bluetooth wireless technology hence you can hook up devices that make use of this particular feature. The product allows users to appreciate quality sounds from compressed audio as well. Majority of users have a collection of audio MP3s in WMA or MP3 formats. They are nice to listen to on desktop computers and other like devices, however, because it is a compressed kind of format, it falls short on quality. However, the technology coming from this setup is able to bring back the details that were lost over the course of the compression procedure. This is the ideal system for individuals who are on the hunt for a 100 percent high-quality sound for a small-to-medium space. It is also a nice setup for people who want to hook up CD players, DVD/Blu-ray players, or listen to various audio from units like smartphones, iPods, or other MP3 players. It has multiple HDMI inputs and includes exclusive wall mounting supports. Those are the advantages of owning this unit. One of the drawbacks of this setup is it does not have a built-in DVD or CD player. You still have to connect your own players to this system. The setup also comes with wiring so you have to make sure to keep it organized every now and then. It is also not network/Wi-Fi-capable. 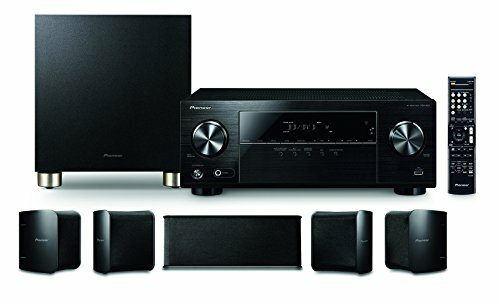 For individuals who want a home cinema experience with amazing sound quality and can back up current video displays, the Pioneer 5.1 Home Theater System is made for you. This is a very nice investment for homeowners who want an advanced home entertainment setup that comes at a reasonable price. This is absolutely one of the best around for the price tag it comes with! Do keep this model in mind if you are on the hunt for a quality home theater system.